The tense hours before Zuccotti Park protestors won a temporary reprieve. View PHOTOS of Occupy’s all-nighter. Explore MoJo‘s updated map of protests worldwide. 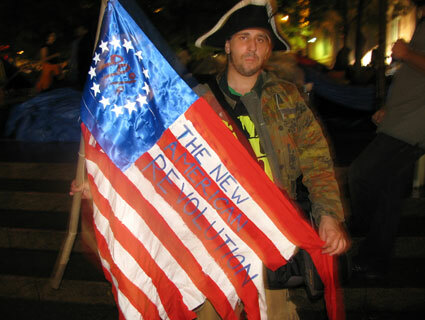 Check out all of our #OWS coverage. The news electrified a crowd of about 3,000 occupiers that had steadily grown in numbers as the wet night brightened into dawn. Many of them had worked nonstop since Thursday evening sweeping the park and scouring its granite walkways with brushes—a calculated attempt to deprive Brookfield Office Properties of its main justification for evicting them. While the company had claimed that it only wanted to move the occupiers to conduct a thorough cleaning, it has also issued a set of rules that would effectively prevent them from returning by banning camping, tarps, and sleeping bags. Now approaching its fourth week in Zuccotti Park, Occupy Wall Street, or #OWS as it’s known on Twitter, has become the nexus of a global protest movement with satellites in more than 120 cities. It has galvanized activists on the left and won over a substantial majority of Americans, according to polls, while also retaining its independence from either political party. While it’s still unclear what kind of impact it will have on policy debates or the 2012 elections, it has served as a powerful megaphone for progressive concerns such as income inequality and the corporate control of the political system. Blue-collar workers weren’t the only ones who stuck it out through heavy rain to show their support. Sitting on the sidewalk with a netbook in her lap to use the WiFi emanating from a nearby McDonald’s was a 20-something graduate student who said her name was Sam. Until recently she worked as a gardener in Connecticut for a 50-year-old, retired Goldman Sachs billionaire. “I liked it as far as you can like a job that barely pays you and has no health insurance,” she said. She doubted her graduate degree would help her much. “Most of my friends will never have kids, won’t buy houses,” she said. “They’re all on food stamps.” Just like her. “You don’t feel bad because there’s nothing you can do.” Or so she thought until she heard about Occupy Wall Street and drove down from Massachusetts. Photo: Josh HarkinsonThe steely determination of the Occupy Wall Street protesters was leavened, at times, by doses of the carnivalesque. Wonder Woman showed up, as did a guy dressed as Santa. Twenty-nine-year-old artist Clark Stoeckley found a parking space amid a row of television vans for his WikiLeaks truck, which, contrary to the suspicions of the Secret Service, has nothing to do with gathering news for the group run by Julian Assange. It does, however, have a comfortable couch inside.